Table Talk on the Global Compact for Safe, Orderly and Regular Migration (GCM) at Kochi, Kerala. Table Talk Discussion on the Global Compact on Migration (GCM) held at Pastoral Orientation Centre (POC) Kochi on 2nd February 2019 where 40 participants from the trade union fraternity and catholic labour movements attended. Fr. Jaison Vadassery, Secretary CBCI Office for Labour, New Delhi introduced the topic calling upon the 20 points agenda of the Catholic Church on Global Migration issues. Fr. Varghese Vallikat, Deputy Secretary General of the Kerala Catholic Bishops’ Conference of India recalled the backbreaking commitment of Pope Francis on this issue of Global Migration and the efforts taken to welcome the migrant families to Vatican against wide disapprovals and cynicisms levelled against him in this regard. Mr. Rafeek Ravuther, the Director of Centre for India Migration Studies (CIMS) was the main speaker of the day. The program was organised to mark the much awaited visit of Pope Francis in an Arabian Country, UAE scheduled to be held from February 4th onwards where a big number of labour Diaspora of Indian origin works. The following points were the key areas of discussion in the meeting. 1. The policy approach of Indian Government in the implementation of the 23 guidelines in the Global Compact on Migration in India. India is an abode of undocumented migrants from neighbouring countries like Bangladesh, Sri Lanka, Nepal, Myanmar etc. Influx of Rehinyans Refugees from Myanmar is a serious refugee crisis in the country. The new immigration bill to be tabled in the ongoing parliament session would be the first policy framework after India signing the GCM in Morocco last December 2018. The Global Compact on Migration and Global Compact on Refugees are not biding documents of international compliances, but give 360 degree road map solutions to manage migration and refugees issues globally. 2. The 20 point agenda of the Catholic Church to tackle migration and refugees issues globally proposes the idea human family as a global village where migration should be understood with a positive mindset and the richness the migrants bring to their new place in the destination. The key propositions of the Documents like Welcome, Promote, Protect and Integrate migrants are the positive solutions keeping in mind the sovereignty of each country over their boundaries and corridors. At the same time the cultural, social and economic contributions of the migrants to the place of their migration has to be valued with utmost importance and positive outlook. 3. The internal migration within India is a serious matter of concern. The replacement migration is happening in many places and urban centres in our country. The migration policy of our nations and of each state should specifically spell out the protection of the migrant workers from all kinds of dangers of exploitations, forced labour, child abuse and human trafficking etc. 4. The illegal recruitment and fake visa exploitation etc. still continues in spite of varied measures taken by the government to check these. Therefore strict monitoring and the safe channels of migrations have to be developed through bilateral relations with the countries of origin and destinations. 5. Children of immigrants should be detained at any cost and at any circumstances. Efforts have to be taken to promote family unification visas. 6. Our country has to take serious efforts to find out the missing people gone as labour migrants and never returned back. An exhaustive list of the missing migrant worker has to be developed and genuine effort has to be taken to find out them and bring back to the native. 7. The pre departure training of the migrant workers and reintegration of them once they come back to the country has to policy decision of the government. 8. The migrant data manager promoted by CBCI Office for Labour has to be popularised to gather the data of the migrants of the Christian origin to different part of the country and abroad to ensure their pastoral needs satisfied by the local church personnel. 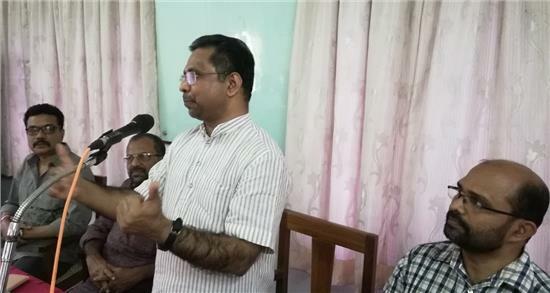 Mr. Joy Gothurth, President Workers India Federation moderated the Table Talk Workshop and Mr. Joseph Jude, the national convenor of the trade unions of the Church in Kerala facilitated the sessions.